George Ngwenya’s life has become a little bit easier in the past couple of weeks. The 65-year-old grandfather, who is a scout for the Victoria Falls Anti-Poaching Unit (VFAPU), lives in a rural village just outside Zimbabwe’s top resort town. His daily 10km commute to work used to be a bit of a hassle, reliant on public transport, which also cost him some of his modest earnings. 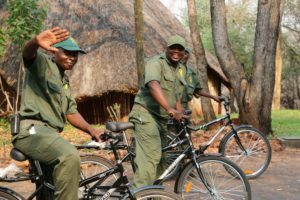 This all changed on September 28 when George, along with the 16 other VFAPU scouts were gifted bicycles by international charity World Bicycle Relief through leading Zimbabwean hospitality group Africa Albida Tourism. George’s commute to work is now a cheap and reliable hour, and he and the other scouts are also able to use their bicycles to both get to and from patrols, and sometimes even use them for patrols. “We are happy with our bicycles because we can now get to places in good time,” George says. “If we need to get somewhere to make an arrest, instead of taking two hours to get there by foot, we can now get there much more quickly,” he says. VFAPU head of operations Charles Brightman says the bicycles are having a positive impact on the lives of the scouts. “They were given locks and chains, so they can hide the bike, do a patrol, and move to the next area,” he says. 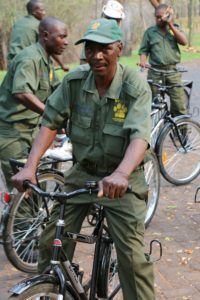 So the bicycles are already saving on transport costs for the cash-strapped unit, which tackles all forms of poaching in the Victoria Falls area, and they have also paved the way for more rapid responses, crucial in catching poachers. “Bicycle patrols are quiet and can be on poachers quite quickly.” Brightman says. World Bicycle Relief – Zimbabwe country director Gareth Desmond says since the organisation came to Zimbabwe in 2009 close to 50,000 bicycles have been given to locals in the education, health and conservation sectors. School children, particularly girls, have so far benefitted most, Desmond says. The unisex bicycles, called Buffalo Bicycles, are specifically designed for use in rural areas, he says. and more durable than other bicycles, with the ability to carry loads of up to 100kg on the carrier. someone to earn a living, it ensures the bicycles are maintained, which is crucial, Desmond says. “They are a life time bicycle, so they are expected to last the life of their owner,” he says. World Bicycle Relief, founded in 2005 by F.K. Day and Leah Missbach Day, operates in several countries, including Zambia, Kenya and Malawi, improving the lives of many. It’s the little things in life that make the world of difference.